Toyota's factories in Japan export about 42 percent of all output, suggesting a big hit to shipments to other markets because of two recent earthquakes. BEIJING -- Toyota Motor Corp. expects to lose 80,000 units of production after shutting down nearly all of its assembly plants in Japan after two killer earthquakes disrupted parts supplies. The losses include about 3,000 to 4,000 deliveries to China, Hiroji Onishi, Toyota’s senior managing officer for China, said on Sunday ahead of press previews for the Beijing auto show. Onishi did not outline the impact on other regions, but Toyota’s factories in Japan export about 42 percent of all output, suggesting a big hit to shipments to other markets. Toyota has only just been able to calculate lost production and isn’t sure when it will be able to recoup output, Onishi said. Toyota has said it may have to ask its union to work on weekends or holidays to catch up. Toyota already said it will start bringing suspended plants back online starting on Monday. It was forced to idle assembly plants after two strong earthquakes rocked suppliers in Japan’s southwestern island of Kyushu, the first striking April 14, the second on April 16. Toyota bounced back partly by working with stricken suppliers to source parts from other factories in Japan or overseas. Among the affected suppliers: Toyota Group supplier Aisin Seiki and Renesas Electronics Corp., a maker of automotive microchips. 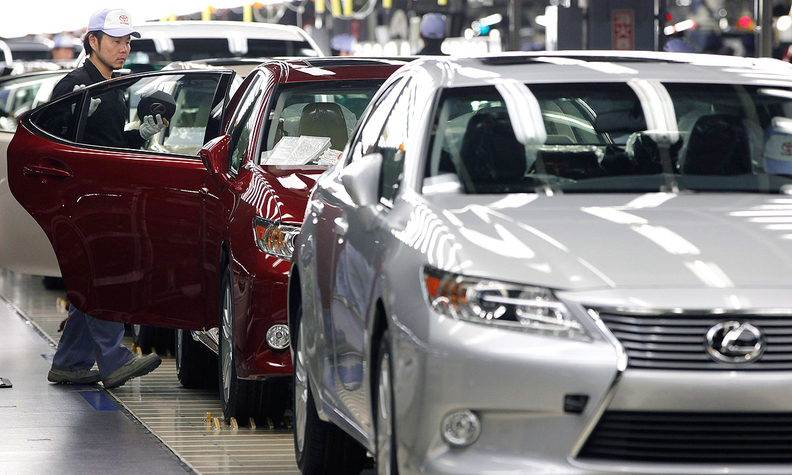 Toyota will gradually bring the plants back online, with most in operation by Thursday. Still, some factories will remain down, including its Motomachi plant in central Japan and its Miyata plant near the quake zone, both of which make Lexus vehicles. Toyota offered no timeline for restarting those plants. They manufacture the popular Lexus RX and NX crossovers, as well as the GS and ES sedans and the CT hybrid hatchback. Toyota’s Tahara plant, which makes other Lexus vehicles, including the GX SUV, the IS and LS sedans and the RC coupe, as well as the Toyota 4Runner SUV, will be fully online on Thursday.